I stand by my statement with this pesto. Yes, it’s packed with so-called super foods, but it’s also mighty tasty and ready in under 10 minutes. Hemp seeds are new to me. I’d come across them in health magazines and vegan blogs before, so I knew they’re high in protein and full of essential amino acids. I’m not the kind of person who takes wheat grass shots just because they’re healthy, though. I wasn’t interested in hemp seeds until I read in Martha Steward Living that they actually taste good. Like pine nuts, sorta. Sold! I found a bag of hemp seeds in the supplement aisle of Whole Foods for 10 bucks, reminded myself that they’re still cheaper than pine nuts and tossed the bag in my cart. At home, in a post-shopping fit of hunger, I whirred together garlic, kale and hemp seeds in my food processor. I reheated some leftover pasta from the fridge. About 10 minutes after I got started, I was enjoying a super nutrient-dense dinner. I must have polished off at least 1/3 cup of hemp seeds and half a bunch of kale in one sitting. I’m expecting my Popeye muscles any day now. Later, it occurred to me that I could use flaxseed oil instead of olive oil in the pesto. I had a forgotten bottle of flaxseed oil in my fridge. Flaxseed oil is a bit limited in cooking preparations, since it should only be served chilled or at room temperature. To retain nutritional benefits, both flaxseeds and hemp seeds should be kept in the refrigerator and never cooked. The flaxseed oil significantly ups the amount of omega-3’s in the pesto. I couldn’t detect the flavor of flax in the pesto, which was a big plus. The oil has made a few of my salad dressings taste overwhelmingly flax-y. 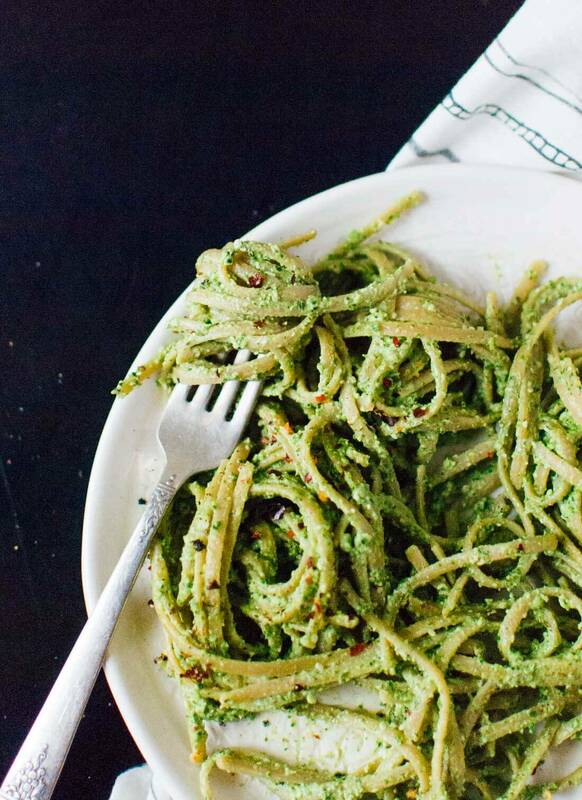 The hemp seeds disappear into the pesto, too, leaving a pleasantly nutty flavor and some creaminess. If you don’t have hemp seeds and flaxseed oil on hand, you can totally make this into a kale, walnut and olive oil pesto. That version will be very good for you, too. I’ve been trying to incorporate more inflammation-reducing omega-3’s in my diet (my dry skin needs all the help it can get), so I’m excited to have found a delicious way to get them. You can learn more about those omega-3’s here. This pesto is not just for pasta. In fact, I might prefer it as a full-flavored dip or spread rather than on pasta. You could spread it on sandwiches or wraps and mix it into quinoa or grain salads. I’m also thinking it would be great with wild rice and roasted carrots. Or potatoes. On toast, with or without a fried egg on top. Speaking of eggs, you could mix this pesto into scrambled eggs or serve it on top of a frittata. If you are serving the pesto on pasta, you could lighten up the meal by adding more produce. In the summer, you could mix in zucchini noodles and/or grilled bell peppers and/or slow-roasted tomatoes. Sautéed mushrooms or chunks of roasted winter squash would be nice in the cooler months. Let me know how you like it! 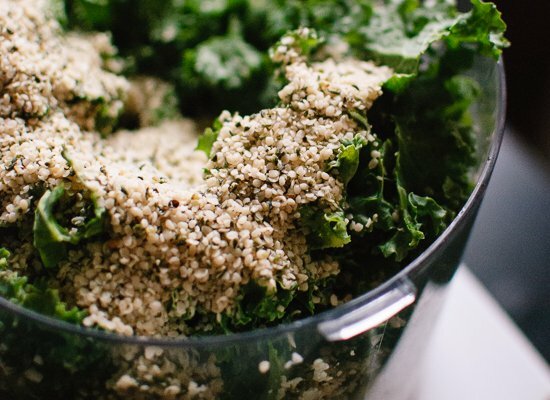 This kale pesto recipe is made with Omega 3-rich hemp seeds and flaxseed oil. Ready in under 10 minutes! For a more pantry-friendly option, use walnuts/pecans instead of hemp seeds and/or olive oil for the flaxseed oil (it’s just as tasty). Recipe yields about 1 ¼ cups pesto. Cook the pasta (optional): Bring a large pot of salted water to boil. Add the pasta and cook until al dente, according to package directions. Reserve one cup cooking liquid before draining the pasta. 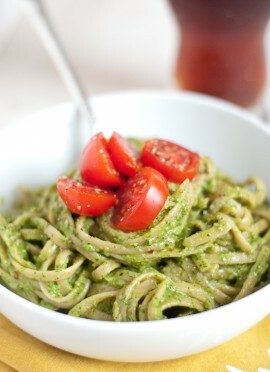 Let the pasta and pasta water cool for a minute to make sure the high heat doesn’t damage the flax oil pesto. If you intend to have leftovers, transfer the amount of pasta you think you’ll be eating immediately to a serving bowl and mix in pesto with splashes of cooking water. Otherwise, you can mix the pasta and pesto together in your cooking pot, adding splashes of cooking water as necessary. Keep in mind that you have diluted the flavor a bit with the cooking water, so taste and add more lemon, salt or a drizzle of olive oil as necessary. Recipe loosely adapted from The Oh She Glows Cookbook. Suggestions for leftovers: If you intend to have leftover pasta, it’s best to store the noodles and pesto separately. Avoid reheating pesto (it will lose its vibrance and some of its flavor)—especially if you used flaxseed oil, which is heat sensitive. 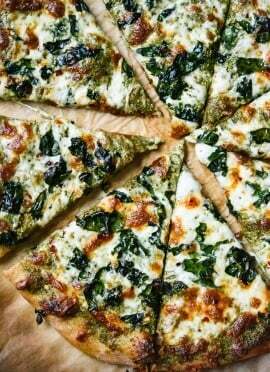 To serve, bring the pesto to room temperature and add a little water if necessary to get the right consistency. 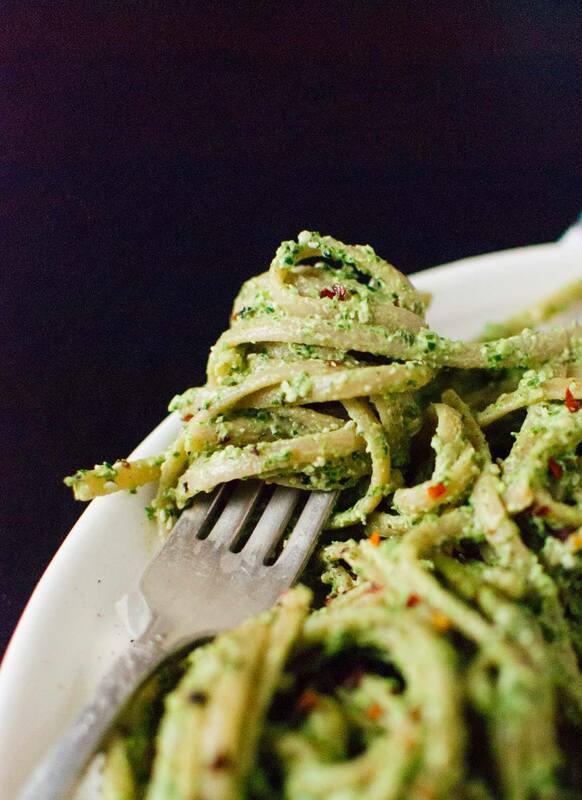 Make it vegan: This pesto is vegan as long as you skip the Parmesan. Make it gluten-free: This pesto is gluten-free; just be sure to serve it on gluten-free pasta or whatever else. Make it nut-free: Use hemp seeds instead of walnuts or pecans. Recommended equipment: If you’re in the market for a food processor, I love this small, highly rated Cuisinart food processor (affiliate link). This looks heavenly! 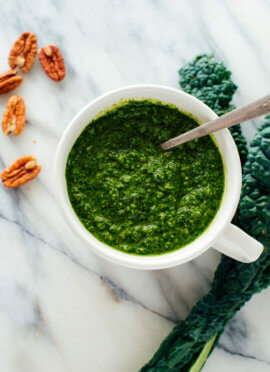 I love pesto in general and the idea of making it with kale sounds delicious. I’ve never actually tried hemp seeds, though I’ve always wanted to! Let me know what you think, Grace! I love the combo of kale and walnuts. Can I use this as a dip with crackers? I have never commented on someone’s recipe before, but…this is THE best online recipe I have ever tasted! I used olive oil and linguine. Tonight, I will be dreaming of lunch tomorrow–kale pesto smeared on multigrain bread with fresh tomatoes. I’m so glad you commented, Sue! Thanks so much for the review. I am going crazy with the amount of kale I have. 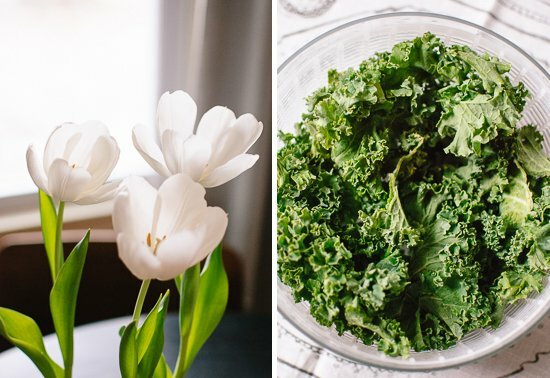 After market I want to use the kale I don’t sell. Can you tell me please if this freezes well? I LOVE this recipe. 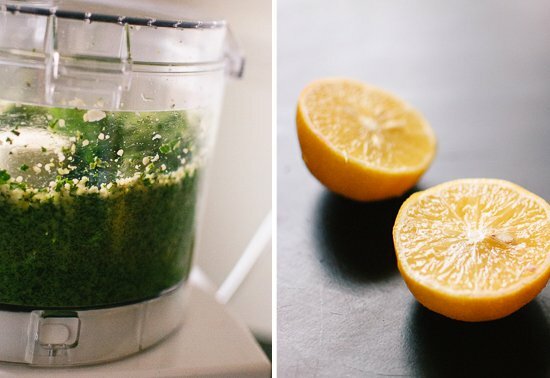 It is such a powerful punch of superfoods. I made it vegan by using nutritional yeast instead of parmesan cheese. It was wonderful served over spaghetti squash with some pan roasted cherry tomatoes over top. Thanks for the inspiration! Thanks for sharing, Tracy! The combination sounds delicious. I appreciate your comment and review! This is such an amazing receipt! I could not stop eating my pasta. I also added sprouted mung beans and shallot on top. Brilliant! Loved this! Even my 6 year old picky eater enjoyed it. I just omitted the chili flakes. I’ve been using your recipes for years and have never been disappointed! 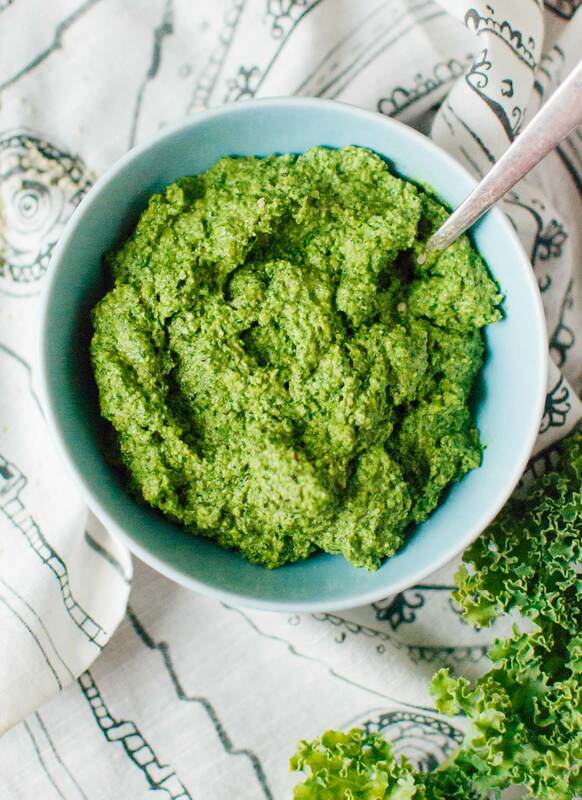 This kale pesto is especially great because I have a photo of my 2 year old dipping his fingers into the leftover pesto and eating it. Seriously, he LOVED it! Toddler approved! I’m so happy to hear that, Katherine! Thanks so much for commenting. I’m glad your little guy loved it! You’re welcome, Maria! I’m happy you loved it. This pesto was amazing! Like another commenter, I added nutritional yeast in place of the parmesan. For the pasta I used shells and like you suggested, I added more lemon at the end. Wonderful, fast, and so pretty! Thanks, Kelley! I’m glad you loved it. Delicious! I didn’t have time to look for hemp seeds so used pine nuts and pistachio nuts that I had. We mixed zoodles and whole wheat spaghetti noodles and a little nutritional yeast on top. Definitely will make it again. I’m glad you liked it, Beth! Thanks for the review. Hi Poppy! I know it isn’t vegan, but there are vegetarian options out there. You just need to look at the ingredients. Thank you for the comment! I’m glad you loved it, Meg! Thanks for your review. So tasty and perfect for this time of year where we are transitioning to Spring! I had it with zucchini noodles, broiled cherry tomatoes and pan fried prawns! We cant wait to make it again! Thank you!